The personal assistant of a deteriorating veteran actor struggles to get him through a difficult performance of King Lear. As the applause grew fainter ... As the spotlight grew dimmer ... His women were younger! Billy Rice: You were a pretty little thing. Not that looks are important - not even for a woman. You don't look at the mantelpiece when you poke the fire. 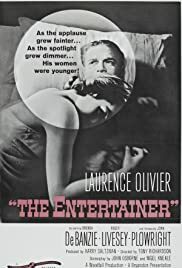 One of the best British films of the sixties, The Entertainer was written as an allegory of Britain's fall from grace by the leading fist-shaker of England's band of Angry Young Men who stormed the London stage with revolutionary new ideas and content, John Osborne. While Look Back In Anger is a more decorated play, this film adaption by Osborne and Nigel Kneale carried the flag of teeth-crunching kicks that the gang of young playwrights hoped to startle the daylights out of England with. Reading the other viewer comments, it is obvious most folks were looking for a Disney story with a Shakespearean performance by Lawrence Olivier. A happier ending? Great Britain forgot to supply one, Andy up there in the mountains somewhere, and the seedy digs were meant to be depressingly seedy, as was the dwindling talent of the family, and its reliance in the end on the grand old name and the grand old accomplishments of the past, as Archie Rice gave his best in replacing his revered father, Billy. Note his offkey performance in singing early on and then the eloquent on key final rendition of "Why Should I Care" as the final performance ends not with a curtain call, but with the hook, as the theater management (those other nations running the world today) angrily demand that Archie get off the stage because he is through, finished, washed up, fired, kaputsky, so long and goodbye. From the direction of Tony Richardson to the selection of grand old places along the sea that Britain once ruled with absolute certainty, everything and every moment of this film are topnotch. The aforementioned slandered scene with Roger Livesey as the Grandfather, Billy Rice, and Brenda de Banzie as Phoebe Rice, involving a misunderstanding over a piece of cake, is one of the most moving and depressingly realistic family arguments ever written. It may not be Olivier's greatest performance ever, but for certain it is the best one ever filmed. It also features the film debut of two actors who would establish themselves among the very best performers Great Britain has offered us, Alan Bates and Albert Finney, along with the introduction of Joan Plowright. As for the unkind comment about Olivier marrying Joan Plowright and this somehow having an ironic similarity to the theme of Archie and his young women; they married in 1961 and REMAINED together until Olivier's death in 1989, which is completely the opposite of the point made in the story. Well anyone is allowed to be in error, but this great film has to rank with our own country's Night of the Hunter as one of the most misunderstood films of all time. Don't miss it,ever, and MGM Vintage Classics has issued an excellent DVD edition.